اولادی, رضا, گرگیج, رحمت‌اله, امامی نسب, محمد, نصیریانی, سعیده. (1395). بررسی ویژگی‌های آناتومی، فیزیکی و شیمیایی چوب گونه تند رشد گز شاهی (Tamarix aphylla L.). مجله صنایع چوب و کاغذ ایران, 7(4), 511-522. رضا اولادی; رحمت‌اله گرگیج; محمد امامی نسب; سعیده نصیریانی. "بررسی ویژگی‌های آناتومی، فیزیکی و شیمیایی چوب گونه تند رشد گز شاهی (Tamarix aphylla L.)". مجله صنایع چوب و کاغذ ایران, 7, 4, 1395, 511-522. اولادی, رضا, گرگیج, رحمت‌اله, امامی نسب, محمد, نصیریانی, سعیده. (1395). 'بررسی ویژگی‌های آناتومی، فیزیکی و شیمیایی چوب گونه تند رشد گز شاهی (Tamarix aphylla L.)', مجله صنایع چوب و کاغذ ایران, 7(4), pp. 511-522. اولادی, رضا, گرگیج, رحمت‌اله, امامی نسب, محمد, نصیریانی, سعیده. بررسی ویژگی‌های آناتومی، فیزیکی و شیمیایی چوب گونه تند رشد گز شاهی (Tamarix aphylla L.). مجله صنایع چوب و کاغذ ایران, 1395; 7(4): 511-522. گز شاهی (Tamarix aphylla) درختی تند رشد و همیشه‌سبز بوده که در بیشتر خاک‌ها رشد کرده و شرایط شوری را تحمل می‌کند. علیرغم اهمیت زیست-محیطی و پراکنش خوب آن در مناطق مرکزی و جنوبی ایران، ویژگی‌های چوب این گونه کمتر مورد توجه قرار گرفته است. با این حال، به تازگی استفاده از این گونه برای صنایع سلولزی در مناطق خشک کشورهای خاورمیانه مورد توجه قرار گرفته است. از این رو، به منظور تعیین ویژگی‌های آناتومی، فیزیکی و شیمیایی چوب گز شاهی، سه اصله درخت سالم واقع در منطقه زابل (استان سیستان و بلوچستان) به طور تصادفی انتخاب و قطع شدند. ویژگی‌های آناتومی چوب این گونه بطور دقیق و براساس فهرست ویژگی‌های میکروسکوپی برای شناسایی پهن‌برگان انجمن بین‌المللی آناتومیست‌های چوب جهان، تعیین شد. همچنین توزیع لیگنین در عناصر بافت چوبی با استفاده از میکروسکوپ فلوئورسنس مورد بررسی قرار گرفت. محاسبه ضرایب بیومتری الیاف نشان داد که گرچه الیاف این گونه، کیفیت عالی ندارند ولی درمقایسه با دیگر پهن‌برگان مورد استفاده در صنایع کاغذسازی، دارای استانداردهای لازم می‌باشند. در بررسی ویژگی‌های شیمیایی، مشخص شد که چوب گز، نسبتاً سلولز کمی دارد (39%) که این مساله ممکن است ناشی از وجود حجم زیادی از سلول‌های پارانشیمی دیواره نازک در بافت چوبی باشد. لیگنین این گونه در مقایسه با میانگین پهن‌برگان اندکی بیشتر بوده و تمرکز آن در آوندها و فیبرها است. ویژگی‌های فیزیکی چوبِ نمونه‌های مورد بررسی (جرم حجمی و ضرایب همکشیدگی) در دامنه دیگر گونه‌های پهن‌برگ سبک و تندرشد قرار گرفت و از این رو انتظار می‌رود کیفیتی مانند این چوب‌ها داشته باشد. Baum, B.R., 1967. Introduced and naturalized tamarisks in the United States and Canada [Tamaricaceae]. Baileya, 15:19-25. Orwa, C., Mutua, A., Kindt, R., Jamnadass, R. and Anthony, S., 2009. Agroforestree Database: a tree reference and selection guide version 4.0. World Agroforestry Centre, Kenya. http://www.worldagroforestry.org/resources/databases/agroforestree [Accessed Janaury, 2014]. Voulgaridis, E.V., 2009. Commercial European and tropical woods: structure, properties and uses (in Greek). Aristotle University of Thessaloniki, Greece, 92 p.
 Tesky, J.L., 1992. Tamarix aphylla. In: Fire effects information system. U.S. Department of Agriculture, Forest Service, Forest Products Laboratory, Madison. Zheng, Y., Pan, Z., Zhang, R., Jenkins, B.M. and Blunk, S., 2006. Properties of medium-density particleboard from saline Athel wood. Industrial Crops and Products, 23:318–326. Zheng, Y., Pan, Z., Zhang, R., Labavitch, J., Wang, D., Teter, S. and Jenkins, B., 2007. Evaluation of different biomass materials as feedstock for fermentable sugar production. Applied Biochemistry and Biotechnology, 137(1): 423-435. Daoyuan, Z., Linke,Y. and Borong, P., 2002. Biological and ecological characteristics of Tamarix L. and its effect on the ecological environment. Science in China, 45:17-23. Wiesenborn, W.D., 1996. Saltcedar impacts on salinity, water, fire frequency, and flooding. In: Proceedings of the Saltcedar Management Workshop, Rancho Mirage, California, 9-12. Wall, L.C., Child, L.E., Wade, P.M. and Brock, J.H., 1994. Ecology and Management of Invasive Riverside Plants. John Wiley & Sons Ltd, New York, 232 p.
 Ladenburger, C. G., Hild, A.L., Kazmer, L.C. and Munn, L.C., 2005. Soil salinity patterns in Tamarix invasions in the Bighornbasin, Wyoming, USA. Arid Environment, 65:111- 128. Han, Z., Yin, W., Zhang, J., Niu, S. and Ren, L., 2013. Active anti-erosion protection strategy in tamarisk (Tamarix aphylla). Scientific Reports, 3: 3429. Al-Mefarrej, H.A., Abdel-Aal, M. A. and Nasser, R.A., 2014. Influence of the cooking conditions on the properties of pulp and papersheets from Athel wood (Tamarix aphylla L.) obtained by the soda-AQ method. Journal of Food, Agriculture & Environment, 12(2): 1336-1341. Gärtner, H. and Schweingruber, F.H., 2013. Microscopic preparation techniques for plant stem analysis. Verlag Dr. Kessel, Remagen-Oberwinter, 78 p.
 Wheeler, E.A., Baas, P. and Gasson, P.E., 1989. IAWA list of microscopic features for hardwood identification. IAWA Jornal, 10:219–332. Franklin, G.L., 1945. A rapid method of softening wood for microtome sectioning. Tropical Wood Journal, 88:35-36. Ogbonnaya, C.I., Roy-Macauley, H., Nwalozie, M.C. and Annerose, D.J.M., 1997. Physical and histochemical properties of kenaf (Hibiscus cannabinus L.) grown under water deficit on a sandy soil. Industrial Crops and Products, 7:9–18. Kord, B., 2006. Investigation on variation of physical properties of wood from Populus deltoides species in longitudinal and radial axes of tree. Journal Science and Technology of Natural Resources, 1:65-77. ISO 13061-2, 2014. Physical and mechanical properties of wood - Test methods for small clear wood specimens - Part 2: Determination of density for physical and mechanical tests. Efhami, D. and Saraeyan, A.R., 2009. Evaluation of Anatomical and Physical Properties of Juvenile/Mature Wood of Populus alba and Populus × euramericana. 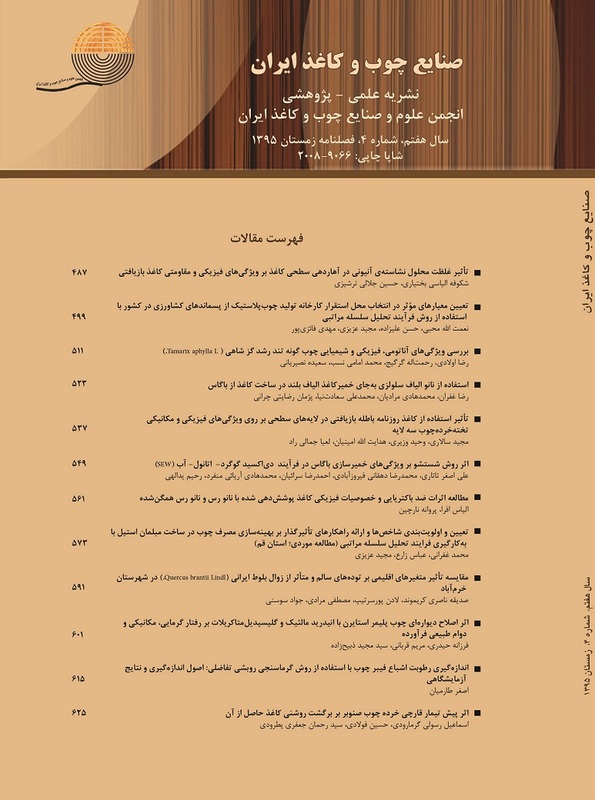 Iranian Journal of Wood and Paper Science Research, 1:134-147. (In Persian). Standard test methods for sampling and preparing wood for analysis. Tappi Test Method T 257 cm-85. 1988. Standard test methods for solvent Extractives of wood and pulp. Tappi Test Method T 204 cm-07. 2007. Standard test methods for acid-insoluble lignin in wood and pulp. Tappi Test Method T 222 om-83. 1983. Standard test methods for ash in wood, pulp, paper, and paperboard. Tappi Test Method T 211 om-02. 2002. Pettersen, R., 1984. In: Rowell, R.M. (ed), The Chemistry of Solid Woods, Advances in Chemistry Series 207, American Chemical Society, Washington D.C., 57-126. Fahn, A., Werker, E. and Baas, P., 1986. Wood anatomy and identification of trees and shrubs from Israel and adjacent regions. The Israel Academy of Sciences and Humanities, Jerusalem, 212 p.
 Bamber, R.K., 1985. The wood anatomy of eucalypts and papermaking. Appita Journal, 38:210-216. Valkomies, P.J., 1969. Wood raw materials for pulp paper in tropical countries. Unasylva, 23(3):94. Ona, T., Sonoda, T., Ito, K., Shibata, M., Tamai, Y., Kojima, Y., Ohshima, J., Yokota, S. and Yoshizawa, N., 2001. Investigation of relationship between cell and pulp properties in Eucalyptus by examination of within-tree property variations. Wood Science and Technology, 35:363-375. Xu, F., Zhong, X.C., Sun, R.C. and Lu, Q., 2006. Anatomy, ultrastructure, and lignin distribution in cell wall of Caragana Korshinskii. Industrial Crops and Production, 24:186-193. Istas, J.R., Heremans, R. and Roekelboom, E.L., 1954. Caracteres Generaux De Bois Feuillus Du Congo Belge En Relation Avec Leur Utilization Dans I'industrie Des Pates A Papier: Etude Detaillee De Quelques Essences. Gembloux: INEAC (Serie Technique, No. 43). Akgul, M. and Tozluoglu, A., 2009. Some chemical and morphological properties of juvenile woods from beech (Fagus orientalis L.) and pine (Pinus nigra A.) plantations. Trends in Applied Science Research, 4(2):116-125. Summit, R. and Sliker, A., 1980. Handbook of Materials Science, Volume IV: Wood. CRC Press, Florida, 459 p.
 Al-Mefarrej, H.A., 2013. Growth characteristics and some wood quality of Tamarix aphylla seedlings irrigated with primary treated wastewater under drought stress. Asian Journal of Plant Sciences, 12(3):109-118. Nourisadegh, A., Kiaei, M. and Samariha, A., 2012. Experimental characterization of shrinkage and density of Tamarixaphylla. Cellulose Chemistry and Technology, 46:369-373.